You might insist that they interview a minimum number of people e.g. 10 in 10 minutes (you will need to adjust this according to the group and time available). 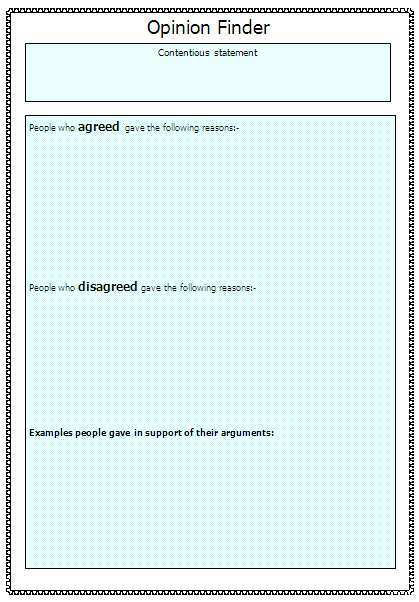 There must be enough different statements (4-6) to ensure that a range of topics or subtopics are being discussed. Pupils holding the same statement sheet then group together and discuss their findings, before teacher-facilitated feedback to the whole class. This small-group session will be more successful if the groups are given very explicit criteria in advance for what they are expected to feedback, e.g. "You must agree on the top three most convincing reasons supporting the statement and the top three arguments against. 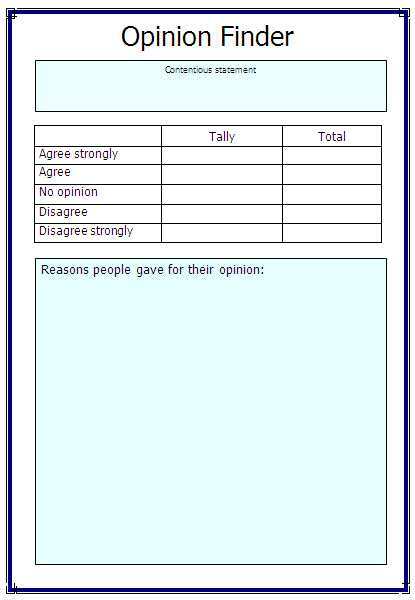 This could also be a valuable opportunity for a bit of numeracy across the curriculum - you might for example insist that groups collate their tally charts and express the numbers of their classmates who agree / disagree as a percentage. Year 6 have been learning about WW2 this half term. From reading Goodnight Mr Tom and their visit to the Britain at War Experience, children were really interested in the evacuation of young children to the countryside. I created 5 different statements ranging from " All children should have been evacuated" " Children's lives were more important than the elderly and adults" and " no children children under the age of 5 should have been evacuated"
Children worked in small groups (each groups having a representative holding a different statement) and discussed with their peers what each one thought of the statements. This lead to powerful dialogue between the children. Some children were quite passionate about their opinions and at times, the discussion became slightly heated. Children took notes on what their peers thought of their own statement. After, all the 1s, 2s .... etc got together. For 15 minutes, they collected the main thoughts and opinions that came up in the previous discussions. They were all instructed to write 4/5 bullet points under each statement, ready for whole class feedback during the plenary. The whole class discussion was meaningful and interesting. Each group presented their statement and spoke to the class regarding reasons for or against their statement. After each group presented, there was a class vote for each statement. (Strongly agree, agree.. etc)The findings are now going to be used for a data handling session next week. In addition, we will be using all the findings to help us plan, draft and publish balanced arguments "Should children have been evacuated during the war?" Over all, it was a fantastic and engaging session. I will be definitely using it again. Excellent speaking and listening opportunities throughout. I used this activity as a starter to a mixed ability Year 11 Geography class. I decided to allocate the various contentious statements taking into account the SENs of the group. Most students fully engaged with the activity, they enjoyed being able to choose who to approach as normally they sit in a seating plan and are kept away from their friends, they were sensible and I overheard a lot of engaged 'learning' conversations. Two students who are shy and lack confidence talked to each other so this initially worked as they were comfortable talking to each other. If I had not intervened they would have stayed put for the rest of the activity. I kept a close eye on them and prompted more confident students to sit with them to ensure they spoke to more children. When the children had to group together and share their answers the activity again worked well, and the feedback part of the activity was lively, with most students eager to contribute. I will definitely be using this technique again as it gets the children focused and thinking! I used this with year 7 and year 8 in RE. It is easily adapted and very well suited to RE exam questions, I will attach my adapted resource. In RE you have to evaluate and consider different points of view and students often find it difficult to actually think empathetically. When they have the opportunity to ask other people and record their findings they have the information they need to complete their exam questions. I also adapted this activity because my classroom is soo small. I have to move the paper around not the students so they past the opinion finder sheets with different statements from one table to the next. Once they had collected the opinions they used the mark scheme to answer the questions and peer assess. It is excellent for giving SEN students ideas and while working in groups others can help them verbalise their answers - also for more talented students it pushes them to search for alternative points of view. It worked well, I will definitely use it again in the future. Guided reading- children given a statement about a particular text type and had to decide why they agreed with it and why they may disagree with it. E.g all successful poems must rhyme. Chn enjoyed the discussion aspect of the task. Valuable resource for discussion of text types and made children question their preconceptions about texts.